This White Gloss Trophy Case With Lighting Has Same Day Shipping If Ordered By 1 PM EST! Purchase Display Cabinets With Confidence Today From Our Large E-Catalog Inventory! More Colors and Finishes Available Online! Gloss white finish (not semi-gloss) blends into any environment seamlessly! Transparent tempered glass top allows guests to view exhibition clearly! 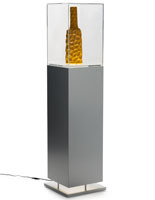 Warm color LED lights located inside can be angled to spotlight attractive features of any gallery display piece! Dual locks secures all items inside base, sliding drawer and case! Pedestal ships assembled, enabling customers to operate case immediately! 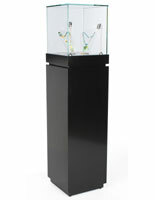 This freestanding retail cabinet, trophy case has a small locking drawer located directly under the case which can be used for storing substitute products. 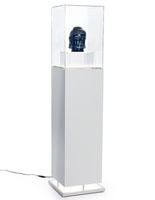 This quality feature in the display cabinets enables the user to quickly change any jewelry product display or art gallery presentation without ever leaving the room to get necessary replacements. The spacious lower cabinet locks as well, and has movable shelf that can accommodate cleaning supplies or additional collection pieces and other items weighing up to 30 lbs! This display tower, trophy case that can be used as a store fixture has a clear tempered glass case which is beneficial when exhibiting expensive, money making products! When this eye-catching, attractive showcase is isolated in a high-traffic section of a store, it will most certainly capture the attention of consumers and guests passing by. 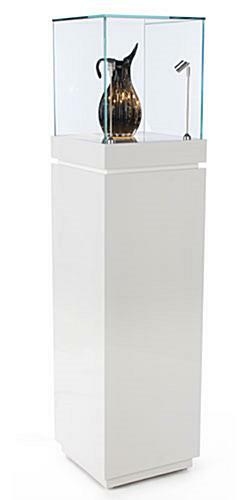 A trophy case, like this pedestal exhibition case, can be viewed from all angles, making it an ideal purchase for any type of exhibition gallery or jewelry/retail establishment! This attention-grabbing glass display cabinet is also offered in three (3) other finishes so be sure to check out the selection and order a finish that harmonizes best with the design of any gallery, retail space, or national history and science exhibit hall today! This is a pedestal exhibition stand, gloss white trophy case that measures 15-3/4"w x 63-11/16"h x 15-3/4"d and weighs 98 lbs! 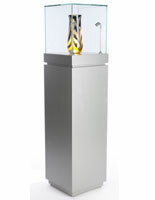 This display tower can be found in common venues such as an art gallery presentation, national history and science artifact collection site, or retail spaces as a jewelry store showcase. 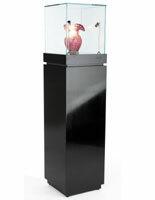 The quality design of this tempered glass, UV glued trophy case is constructed to last a years! This display cabinet effectively highlights the features of any lucrative, money making merchandise! This trophy case that has two warm colored LED lights inside can be adjusted to draw attention to a select portion of the exhibition item! 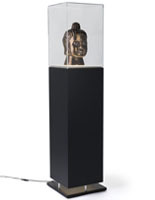 Each light measures 10-1/4" tall and is strategically positioned in the front two corners of the glass showcase so as to not distract the viewer and take attention away from the gallery presentation. A trophy case that can display a jewelry design collection is a beneficial purchase for business owners to use as a store fixture in an attempt to accentuate the newest product line available! Although this glass cabinet is considerably large, it ships assembled and is ready to be used as soon as the tower is completely unpacked from the shipping crate!